Core Vocabulary is a set of 2800 words used most frequently in daily life. It covers ~92% of the English learners would see in newspapers, magazines, books, TV and movies. It is an updated version of what is commonly referred to as the General Service List (GSL) in the vocabulary field. Academic Vocabulary is for learners looking to master words that appear frequently in academic texts and lectures. When learned together with the Core Vocabulary 2800, this list gives ~92% coverage of typical academic materials used in universities in English-speaking countries. It is an updated version of what is commonly referred to as the Academic World List (AWL) in the vocabulary field. Business Vocabulary contains 1700 words for learners looking to master general business English situations. When learned in combination with the Core Vocabulary of 2800 words, this list provides ~97% coverage of the English needed in most general business situations. TOEIC Vocabulary contains 1200 words that appear most frequently in the texts and listening materials that appear on the TOEIC exam. When combined with Core Vocabulary 2800, this list provides ~99% coverage of words that appear on the TOEIC exam. This figure applies to the recent changes to the TOEIC® Listening and Reading test updates, which first appeared in Japan and Korea in May 2016, will be implemented in public test administrations worldwide, beginning in April 2018. The Core Vocab Course is based on New General Service List (NGSL) developed by a team led by Dr. Charles Browne from Meiji Gakuin University. The origin of Core Vocab list is a 2-billion-word corpus developed by Cambridge University. Dr. Browne and his team analyzed the Cambridge University corpus to determine the core high-frequency vocabulary words for students of English as a second language. The Academic Vocab, Business Vocab and TOEIC Vocab courses were also developed by Dr. Browne and team based on separate corpora specifically assembled by them for each list. We provide a Vocab Level Test as a diagnostic test of knowledge of the Core Vocab (NGSL) and Academic Vocab (NAWL) lists that is designed to level students within those lists. The test is based on test items developed by Phil Bennett at Miyazaki International College and Tim Stoeckel at the University of Niigata Prefecture, and Tomoko Ishii at Meiji Gakuin. EnglishCentral has adapted the paper version of the test in several key respects: (1) selected different definitions in cases where our data showed a more common usage in our own corpora, (2) the test items are randomized with each band, (3) the distractors are automatically generated based on similar vocab frequency and part of speech, rather than fixed for each item. The EnglishCentral version of the Vocal Level Test has not been reviewed or endorsed by the Phil or Tim, and therefore please contact EnglishCentral with any questions regarding the Vocab Level Test. To identify all gaps in the student’s knowledge in Core Vocabulary, we recommend that students complete all words in all units of the Core Vocab from their Starting Level. Each course is divided into 20 unit quizzes, which take approximately 3 minutes per quiz, depending on the student’s level. We recommend teachers assign one Unit each week for 100 new words per week, or about 20-30 minutes of study time per week. 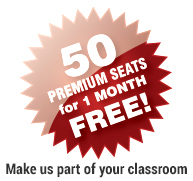 In a one year-program (28-week program), 100 words per week means about 3000 unique Words (Core Vocab, plus Academic Vocab or TOEIC) can be covered in the full year. If students do 200 words per week, about 3000 unique words can be covered in one semester. Students however usually don’t master vocabulary — that is commit words to their long term memory or enable productive use of the word — with one exposure. Rather, multiple exposures are necessary over time in what we call Time Interval Learning. The MyWords application is where the Time Interval Learning takes place on EnglishCentral. All words studied in Vocab Courses (such as Core Vocab, or Academic Vocab) — whether correctly or incorrectly answered — are added to MyWords, so students can study them over time. Words are automatically ordered by “Ready to Study” based on the time interval learning algorithm. Students can focus exclusively on words they got wrong from the assigned Course or from Learn Mode or Quiz Mode in Video Lessons. These “incorrect” words are automatically added to MyWords. Students can also focus on words they have Favorited during their study of the vocab course or while doing Video Lessons. Favorited words are also automatically added to MyWords. Students demonstrate “mastery” of a certain number of words during the course of their study on EnglishCentral using the Time Interval Learning System. Mastery requires 5 correct learns over different time intervals. The 5 time intervals set by the system are: 1 day, 3 day, 10 days and 30 days, and finally . . . mastery = !